This actually ought to tell you something about who will benefit. Hint: These sorts of magazines are serving a certain constituency. Customers will be *empowered* to UPDATE VENDOR DATABASES! Yay – that’s giving back “control” to the customer (sarcasm). Seth, I do try to point out from time to time that the idea of giving people control over their personal data is like giving people control over the reproduction and use of their published works. It’s an appealing prospect, but destined to replace the quest for the philosopher’s stone as a lesson in folly for future generations. The individual is in control of their body, their private domain and their voice, their will as to what they authorise to publish, their choice as to what of it they endorse, and their word as to their current knowledge, thoughts and beliefs. That is naturally sufficient and ample. To pursue the supernatural control of information or intellectual works in others’ possession is to chase after 18th century privileges we should now recognise as obsolete anachronisms at best, and instruments of injustice at worst. Corporations may have been allowed to become monsters, but you do not reign them in by seeking or pretending to possess supernatural powers to control the information they hold. And finding some of them to meekly acquiesce to such pretence is to find accomplices in a charade. Unfortunately, as you know, some quests have a holy guarantee of success, and those embarked upon them do not take too kindly to detractors. You’re familiar with censorship of evil being divine and consequently guaranteed to succeed. The belief that people must be able to control their personal data enjoys the same divine beneficence. Great to hear about the onset of vendor relationship management. 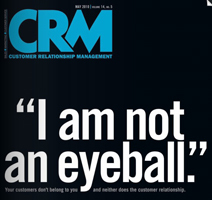 There’s a great deal of dialogue between the CRMs and VRMs lately. Who should be more in control? Will this change everything? Its a new tug-of-war altogether. Who’s renting? and who’s keeping tabs on who? I like to see how this all plays out.